I've been missing springtime in Virginia so much recently. That always used to mean sitting on the front porch watching the traffic go by. 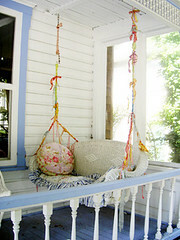 I would love to do that from this swing. So adorable!